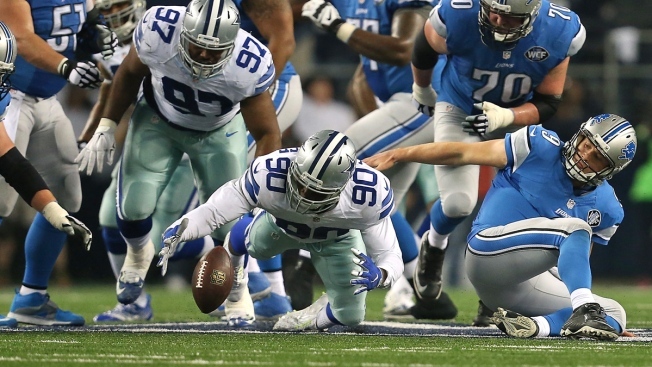 Dallas Cowboys defensive end DeMarcus Lawrence is just eight games into his NFL career, but he says he doesn’t feel like a rookie anymore. A second round pick out of Boise State, Lawrence suffered a broken foot in training camp and was forced to miss the first eight games of the year. He finished the regular season with a modest nine tackles, but made his presence felt in the playoff win over the Lions with two tackles, including the game-sealing strip-sack of Matthew Stafford. Stay on top of the latest Dallas Cowboys news with NBCDFW.com. Follow NBC DFW on Facebook or have breaking Cowboys news sent directly to your phone with Blue Star SMS alerts. Text "bluestar" to 622339 (NBCDFW) to subscribe, text HELP for more info, and text STOP to end the subscription. Message and data rates may apply.Read more about it here.